Place buttermilk, eggs, melted butter and vanilla in a mixing bowl. Whisk until smooth. Stir in flour, sugar, baking powder, baking soda and salt. Batter will be lumpy. 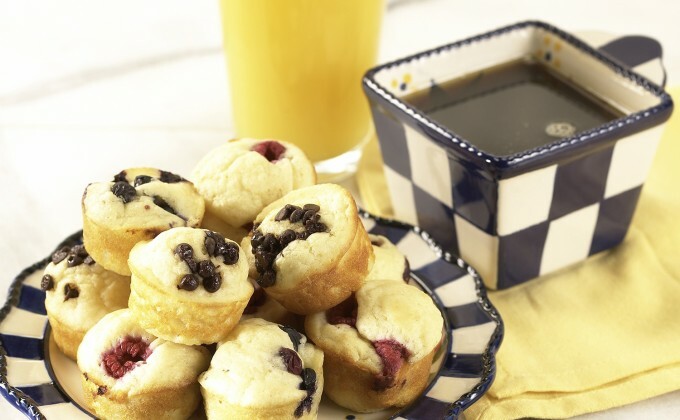 Lightly spray your temp-tations® mini muffin pan with non-stick spray. Fill each cup 2/3 full with batter (about 1 tablespoon each). Sprinkle 3 blueberries on 12 of the muffins. Press down into the batter slightly. Press 1 raspberry into the center of the remaining 12 cups. Once this batch bakes you will sprinkle 1 teaspoon of chocolate chips on the next batch. Bake for 10 - 12 minutes or until a toothpick inserted into the center comes out clean. Cool for a few minutes before flipping out of pan. Fill the pan with the remaining batter. Sprinkle with chocolate chips and repeat baking process.